Scott: We’ve got a couple of guests in the audience. 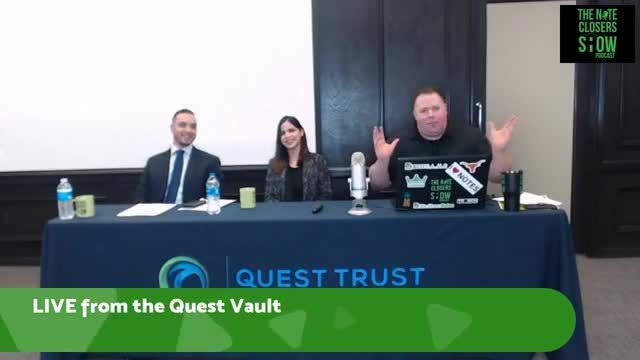 We’re honored again in 2019 to have Quest as a sponsor of the Note Closer Show podcast. It’s a great year with some great numbers throughout the year. We love partnering with you and help promote you because you do such a great job out there as well. I thought we’ll talk in this episode a little about some of the new things going on because everybody always has goals. I want to spend less or I want to save more towards my retirement accounts. I wanted to get out of my job later on. You’ve opened up a lot of new accounts. People are transferring a lot of money over. Keaton: It’s fun to see the fluctuation between late November all the way until about mid-February with everybody trying to finish everything for the end of the year. Open accounts to make sure they have the option to make contributions for 2018 and get 2019 started right before taxes and everything. That’s a lot of fun. I know that Ingrid and I were discussing how the year-end works, especially related more towards Scott Carson clients. The new and seasoned Note Closers. It’s fun going through all the numbers for the year. Scott: That’s always a great thing when you see numbers going up. It’s like Catch 22 for you because Quincy and Nathan are always wanting to open more accounts than you did last year. Ingrid: It’s been good so far. Scott: With the opening of this branch and also the Dallas location as well too. Ingrid: We did some expansions. It’s a corporate office. We have about 100 employees there, but we have some satellite offices in Dallas and Austin, which we expanded where we extended our Dallas office as well too, to get more people to go there. The classroom is the same. It’s about the same size as Sierra. You fit about 100 people in there. We do weekly classes and monthly events but we also are getting some other employees out there. Here in Austin as well this year, we’re going to be growing it. Right now, we have five people working here. We’re planning on bringing more transactions people to better serve our clients here in the area as well. It’s fully operational. Scott: You’ve had people coming out for appointments and drop off paperwork and stuff like that. You still do stuff online. I know I sent in documents on Sunday a note deal with a student of mine, who’s getting some things funded on stuff like that. That’s been done through the private placements and the staff out of Houston. You guys still work very cohesively together. If something’s going on in Dallas or Houston or Austin, the phones ring no matter what and get answered. Keaton: Simultaneously, no matter what, we will still provide world famous customer service, no matter whether you’re here live, you’re on the phone, all through the email. It’s strictly a policy that we all start to stay on top of providing customer service better than anybody else in the industry. Scott: You’ve been on here multiple times. We didn’t officially introduce Keaton. This is your first time on the show?